I held her again for the umpteenth time as Johnny ran out to get us more diapers and supplies for our home. “Please don’t forget the Brustan hunnie!”. “…and my nursing pads! and colic calm!” I shouted as he ran down the stairs, not so sure if he heard everything, but he always did, -because he bought every single thing I requested for. Every minute counted. We were both turned inside out with our “to-do list”. Time never seemed to be enough to do it all. Our schedules were disarrayed if not completely obliterated. We were always on the move. Parenting caused some considerable static in our life. Never did it cross our minds the demands that newborns carry. They basically rule the roost. Spontaneity was not a word to be mentioned again. No more concrete plans, no more fixed schedules, no more balance. “You need to learn how to balance” i was told, but this word, stressed me more than it gave me comfort. The more I read those articles, the more I struggled. That was it! I struggled with balance. Actually, there was no balance at all. I couldn’t seem to get it all in line! What hit me hard was my lack of quiet times, in the evening, with the Lord. Our evenings were planned but had occasional “spur-of the moment”, so the reality of motherhood dawned on me when it took a month plus without having some set alone time to study God’s word. I needed a new direction from Christ. Balance was clearly not for me. I desperately needed a new path, a fresh wisdom. A path that would bring out the best in me for my family for His glory, without feeling as though am losing my sanity. I took my Bible from the drawer and was prompted to read Daniel 2:21. It is God who alters the times and seasons, and he removes kings and promotes kings. He gives wisdom to the wise and knowledge to the discerning. Philippians 2:13 For it is God who works in you to will and to act on behalf of His good pleasure. How profound. Yes! It was God who placed us in that season. He altered our season with the gift of Parenting and only He would give us the wisdom and knowledge to pull through! A heavy burden was lifted off my shoulder as those words stirred a new revelation in me. It was another season in our life. The season of parenting, and motherhood specifically for me. It was God working in me though this season of motherhood to act on behalf of His good pleasure. All I needed was to attune myself to Him, and he would give me the wisdom and knowledge I needed to navigate, through the discernment that the HolySpirit gives. See, as much as God wants us to be level-headed in what we do, he doesn’t tie us down to ‘balance.’ God works with seasons. And if you discern the season you are in, and surrender to His leading, then you won’t be struggling to “keep it all together” in a bid to look balanced. I was to be led by the HolySpirit through that season. As stuck as I felt, He was still at work in the puddle. God was still speaking to me though the mundane things of that season. In the rut, He was outpouring on me what He desires of our little one. So I quit trying so hard to do it all. I quit holding onto “balance” and was led more by His purpose and the priority placements He placed on my way. How freed I felt! I became sensitive to the voice of God when changing diapers, cleaning up, cooking, shopping, dressing up, catching up with Johnny, bathing our little one or even in the stillness of the night. I was not waiting for “quiet evenings” to be with the Lord anymore. The Divine God was already there, speaking to me as I threw yet another dirty diaper! I know there is a lot of pressure on mothers to “keep it all together.” Make a home, please your husband, be there for your children, do ministry, be kind to your in-laws, lose weight, maintain a figure, keep the career going…etc. In a bid to do it all, we lose it all. But God has the best deal for us mommas. He says “No more perfect.” He doesn’t work with the well put, he works with the broken and the willing. How else would he show His perfection if we are already perfect? We need to be led by His promptings, not what the world requires of us. We need to be led by his power, not our own strength. For if he prompts, we will be quick to discern what needs our attention first. It is God, who works in you, through the season of motherhood. TO DO – be it [changing diapers, nursing, cleaning, catching up with your husband] – ALL FOR HIS GOOD PLEASURE. God wants us to rely on him. Only he can give us the strength and grace to do it all- not for the world to see, not to clap for ourselves, not to glory in our skills, not to be given a trophy, not to be known, but for Him to be known -FOR HIS GOOD PLEASURE. God has you in this season. You do not need to do it all. Be free from the burdens and self-inflicted expectations of motherhood and simply surrender to Him who understands parenting perfectly – OUR FATHER IN HEAVEN. He holds the blue-print of your little one(s). 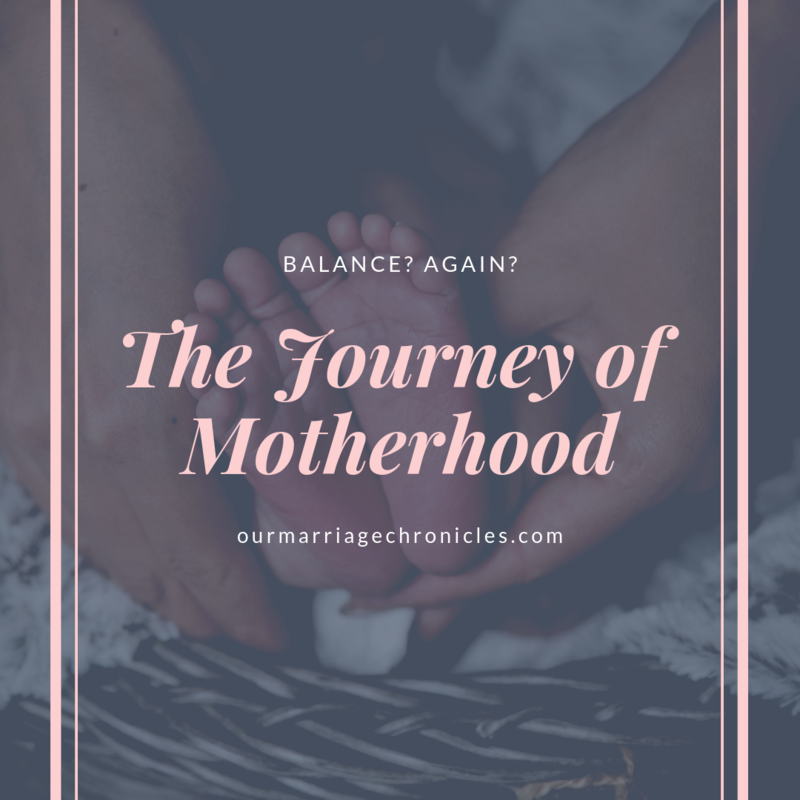 Previous PostTHE JOURNEY OF MOTHERHOOD - TRANSITION. Next PostTHE JOURNEY OF MOTHERHOOD - ON WAITING AND TRUSTING GOD.